Imagine that you live in a wonderful world where there are always fresh biscuits to be had. Wouldn’t that ROCK?! Well guess what? We have fresh biscuits at the Myers’ house all the time. Hop on over to Kitchen Stewardship where I’m sharing the method for making my Mom’s Freezer Biscuits. Now you don’t have to wake up early to make biscuits and gravy. Yep – I love you too. See you there! Into large bowl, stir together flour, baking soda, baking powder, and salt. Cut in butter with a pastry blender until mixture looks like coarse meal. Form into a soft ball and turn out onto a well floured surface. Roll out to desired thickness and cut with biscuit cutter or cookie cutter. Place biscuits in a box, separated by layers of wax paper. Freeze. When ready to bake, heat oven to 450 degrees. 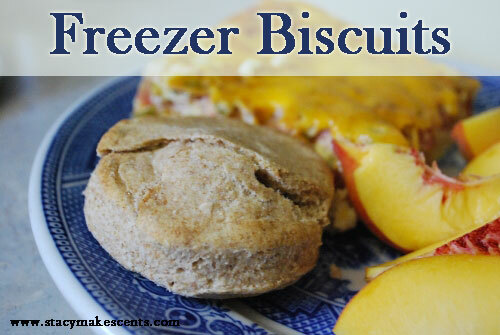 Bake frozen biscuits until golden brown, about 14-18 minutes. This post is linked at Sunday School at Butter Believer. What if I don’t have a pastry blender or many other fancy kitchen gadgets? Is there another way you would suggest that I could blend the butter in? Great tip, Amanda! Thank you so much for adding it here!!! It will depend on the size you cut them and how many times you roll it out – and also if you just cut into squares versus round. I would hate to give you a wrong number – and honestly I haven’t made them since we moved almost two years ago….I’ve just been making bread. 🙂 I am so sorry I can’t help with a number. I would bake them the same but start checking around 8 minutes. Hi Stacy! I have been following your blog for a while. I run a home daycare and try to do meals with few processed ingredients. The kids love these for breakfast or snacks. Sometimes I add blueberries and we call them scones! Thanks for the recipe! Also, I don’t keep buttermilk or kefir, so I stirred a couple of spoonfuls of apple cider vinegar into whole milk to make “buttermilk”. I also used my food processor to cut in the butter to the dry ingredients. I love that quick substitution for buttermilk! I made these for the second time tonight. They are so easy and good. This is the first whole wheat recipe I’ve used that didn’t turn out like hard, flat, hockey pucks. I used white whole wheat flour and baked the whole batch. I froze about half, already loaded with sausage, for easy grab n go breakfasts. Thank you! 🙂 I’m glad you like them! We love them! If you are looking to make this even quicker, instead of rolling them out and cutting them, just use an ice cream scoop (the kind with the little bit that pushes out the ice cream when you squeeze) and scoop them onto the cookie sheet. Yup, I really am THAT lazy. HA! I will admit, I like the neatness of cut biscuits. But I’m ocd like that. Great question Tammy! 🙂 I also grind all of our wheat. When I refer to “pastry flour” it can be purchased at the store under the label Whole Wheat Pastry Flour. If you want to grind it at home (like I do), then you’ll just use soft white wheat berries for the equivalent. Love to grind it AHEM flour, that is! I’ll second on the soft white wheat for “pastry flour,” and the reason why is the protein content. Soft white is the grain to use for quick breads, including cookies, biscuits, anything with baking soda/powder as the leavening agent (low protein). I have made biscuits with sprouted soft white wheat, and they turn out great. Of course, with this recipe, you could do the overnight “soak” with the kefir (or buttermilk), and still have the benefit of reduced phytates and improved digestion (just add the baking powder, baking soda, and salt AFTER soaking). And agreed with an earlier comment on the coconut oil–I usually refrigerate mine, then “shave” it off into the flour as it cuts in much easier that way. I’ve never tried freezing them, tho! Definitely going to have to do this, since most times we make them, I have way too many biscuits left over, and of course, they’re much better “fresh” baked than three days old! We just had some last night for dinner with ham. 🙂 And you’re right….they are SO much better fresh! Oh–and THANK YOU for adding HH in your bloggy links. I just noticed that! If you use coconut oil instead of the butter, then you need to make sure it’s hard so that it will work in……palm shortening might work better.